We know nice guys finish last, but what about nice ladies? They what? They die? Oh. Gwen Stacy was not only Spider-man’s first real woman, but she was also intended to be his only woman, per Stan Lee. The daddy’s girl wanted it all- the marriage, the family, the white picket fence (probably) and if it weren’t for the Goblin, she might’ve had it. Oh, ESFJ- some things just weren’t meant to be. Interestingly enough, the ESFJ functions are the inverse of the ISFP’s, or Mary Jane’s. 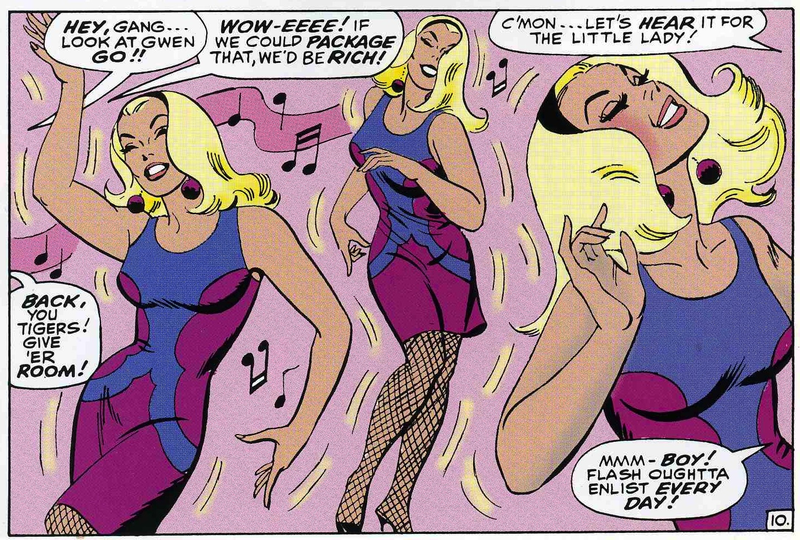 And like Mary Jane, it’s not as simple to point out the functions of Gwen but rather her general character. She was meant to be the “good girl” to Mary Jane’s “party girl” and mission accomplished. While Mary Jane loved her partying (as you may have seen in the previous post), Gwen Stacy did her school work, dated around a bit (gotta party sometimes), but fairly quickly settled on our nerdy hero, Peter Parker. …All while her father played a major part in their relationship. If anyone reading has ever dated an ESFJ, male or female, you’ll know that their family is a huge part of who they are. They can’t escape it, so neither can you. Lucky for Peter, Gwen’s dad died. Because while Gwen blamed Spider-man for her father’s death (Psst- it was Doc Ock! ), she wanted to settle down with Peter after the fact. He rejected, because as people dating ESFJs know, they can seem a bit too forward in terms of the relationship once they’ve gotten comfortable (Experience!). In a national sample, ESFJs were the second highest in terms of a happy marriage/intimate relationship. Whether this was done naturally or because their spouses were pressured into it isn’t stated, har har. It only makes sense that Gwen would believe that marriage would ease her sorrow by making Peter her husband. ESFJ’s major stress coping tactic is talking to someone close, making marriage ideal for them. But Gwen backed off, realizing the pressure she was putting on Peter, much to his relief. This could be read as Gwen’s leading function, Extraverted Feeling. Not only does Gwen wear her heart on her sleeves, so to speak, but she’s also just as willing to empathize with Peter’s hesitation to take the next step in their relationship; for reasons known and unknown to her. Often times, ESFJs are labeled as the perfect mates along with ENFJs. While beauty is in the eye of the beholder, it does make a strong argument that ESFJs are ideal for long term relationships when you look at their functions. It seems all they think of is ways to please those around them and have made it their life mission to take care of others. What’s the problem, right? Yet the ESFJ seems to be the closest personality you can get to embodying ‘altruistic.’ Every other type may have their angle or reason for doing what they’re doing but the ESFJ often gives with no reason or rhyme past ‘just doing it.’ Gwen’s character blends with this well as her choices just about always steered readers into seeing her as “the one” for Peter. A lesser man’s HEAD would EXPLODE trying to decide. 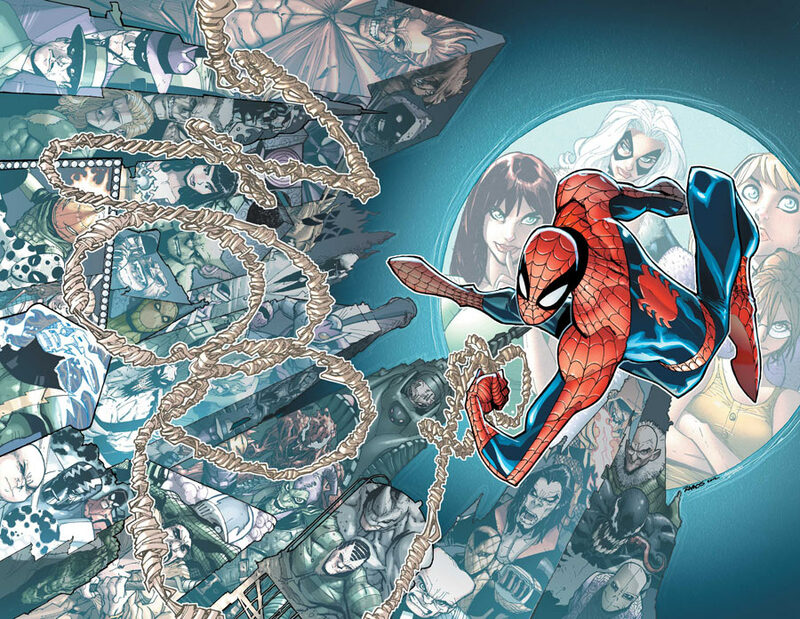 Even to this day, many argue whether or not MJ or Gwen is right for him- and Gwen has done what characters in comics have such a hard time doing- staying dead. You don’t hear this for Cyclops and Jean Grey or Emma Frost. Someone that’s so likable after having died before many readers even had a chance to know her character has got to be a likable personality, if not even ESFJ. 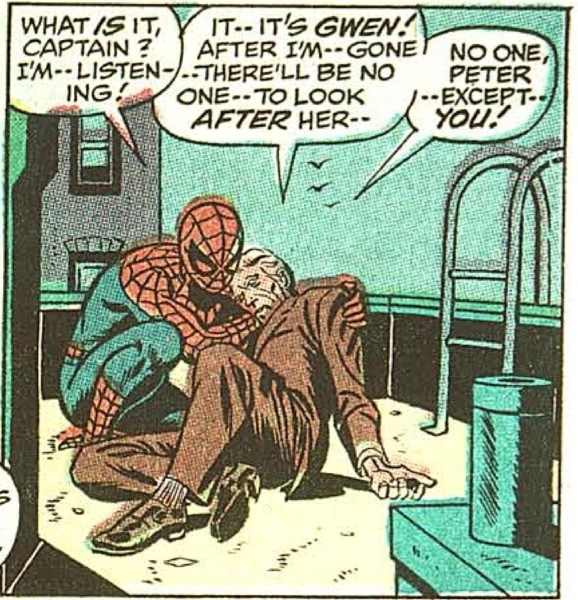 Another unique trait to Gwen is that her death sparked what many believe to be the transfer in comics from the Silver age to the Bronze age; when the meat of the comics had been written and writers were moving onto darker and grittier stories. A world without it’s premier ESFJ being dark and gritty? I can see why. Side note- Sure, Gwen has appeared in comics since her death, but in Ultimate form, as a robot, or a clone daughter- never really Gwen. 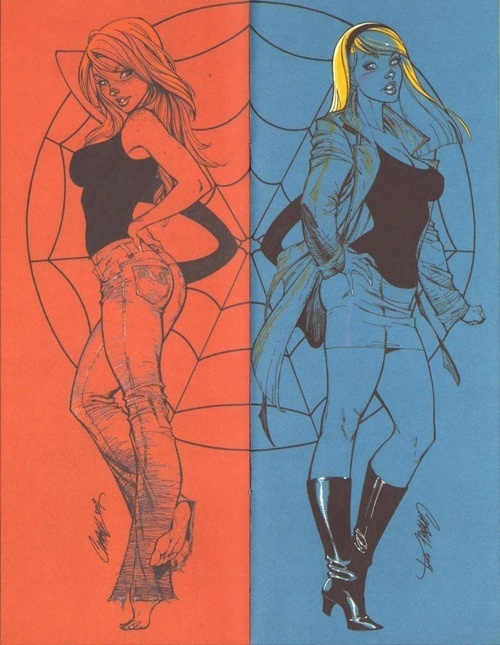 This entry was posted on 09/10/2013 at 1:46 am and is filed under MBTI Guardians, MBTI Stuff with tags esfj, gwen stacy, mbti in fiction, spider man. You can follow any responses to this entry through the RSS 2.0 feed. You can leave a response, or trackback from your own site.